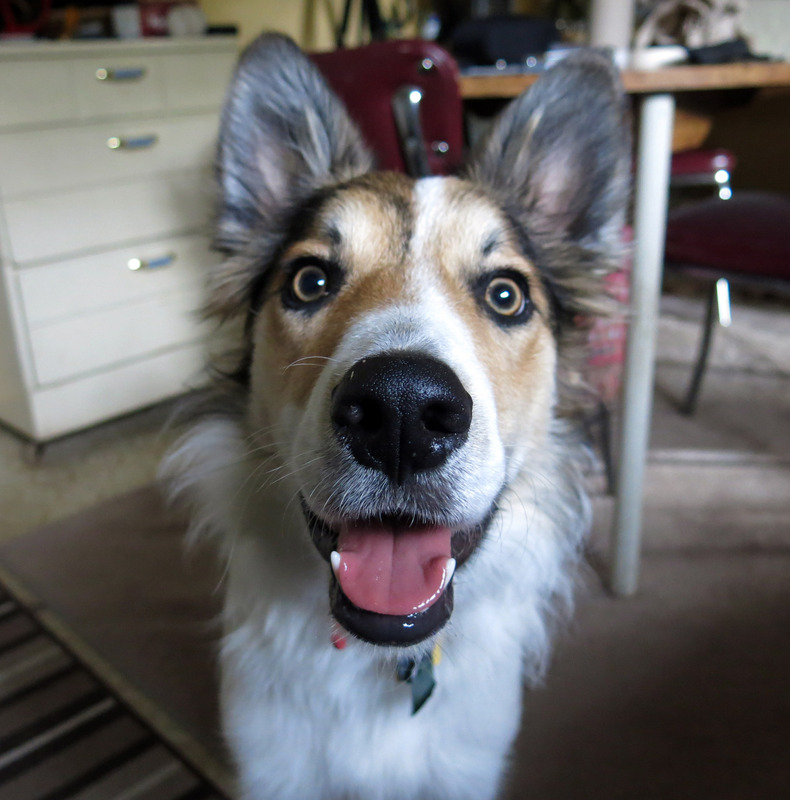 Greetings and salutations, everyone; yes, once again it is I, Mani the not-completely-huge purebred border collie, filling in for the guy I live with, and here to bring you up to date on the news from our garden, and other stuff. You may remember me from such posts as “My New Toy” and “Weirdly Lit”, among so many, many others. Here I am in a characteristic pose. The guy I live with said he was having trouble getting me to sit still for my characteristic pose, and so he had a biscuit on top of his head, which I thought was pretty peculiar. He doesn’t go around with biscuits on his head all the time, if you were worried about that. Here I am in a totally unfocused pose, “looking quite intelligent”, according to the guy I live with. Well, I really wanted that biscuit. I got it, of course. Today was a pretty interesting day. We slept in, which was apparently my fault, because the alarm clock wasn’t set, and so everything started a lot later than usual. The guy I live with went to the store, and then came back. 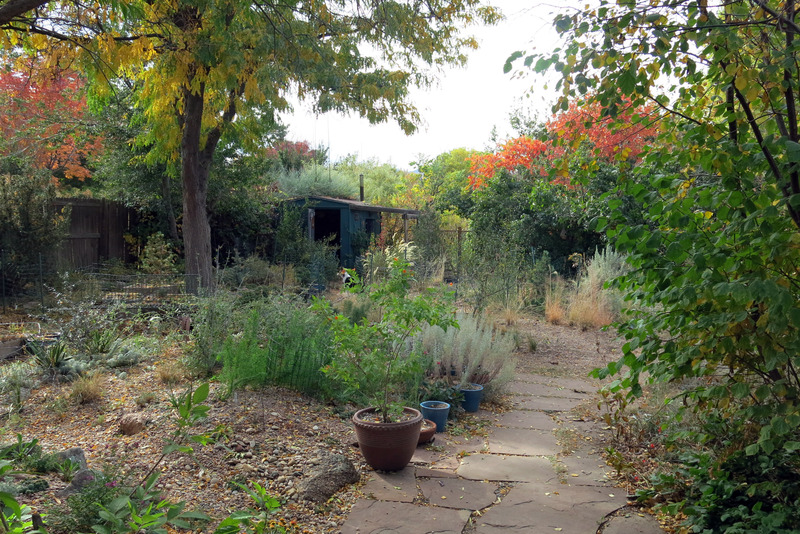 The garden is looking pretty autumnal right now. That’s me, way off in the distance, looking at a squirrel. They eat the pods hanging from the honey locust, and then drop the pods on the ground. I finally tried one, a pod I mean, and it was pretty good. 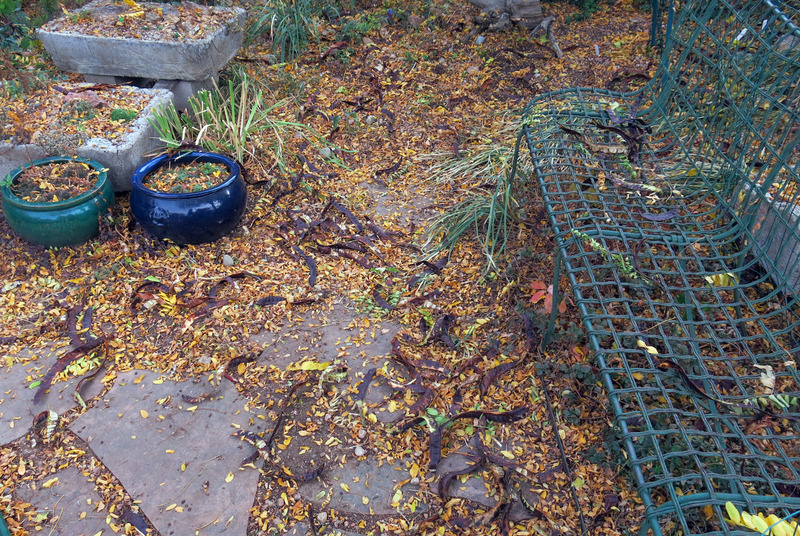 The pods get raked up almost every day, but there are always more. Below, this is how it looks standing on the patio. The guy I live with was standing there; he’s taller than I am. But not fiercer. Oh, the reason everything looks kind of reddish is because it is. The soil here has a reddish tint to it. So does the flagstone. Looking through the shortcut that Slipper made. Slipper was a purebred border collie who lived here before I did. 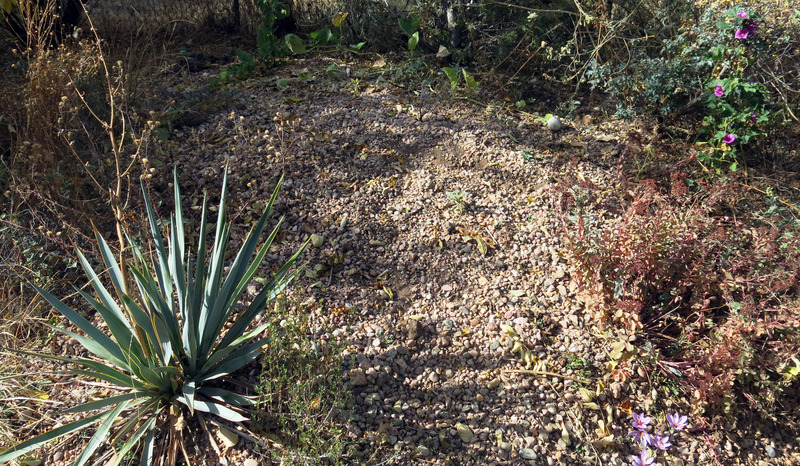 Then the old rock garden. That’s me on the path. If you thought it was someone else, no; it’s me. 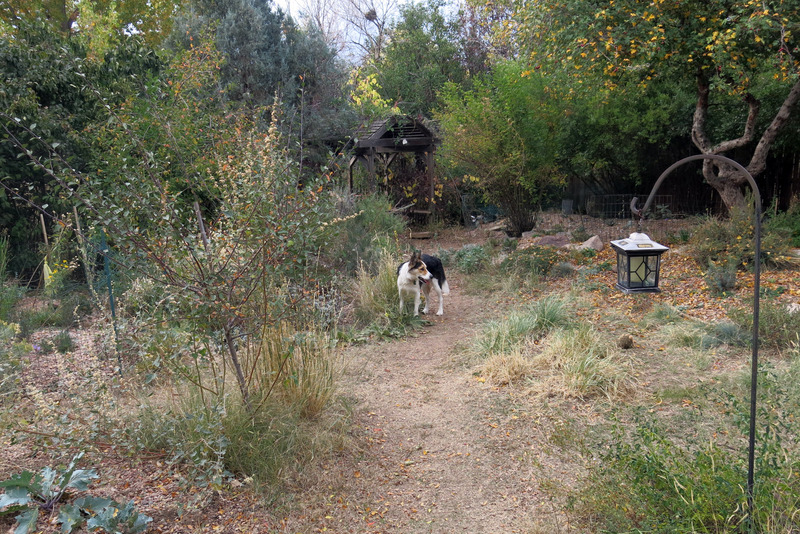 We can get away with dirt paths for most of the year. There are lots of crocuses flowering now. This is Crocus speciosus, sown by ants. There are more in “the enclosure”. Some of them were planted, but most of them weren’t. The fence in the back does lean like it looks. It’s “being fixed”. I guess that in some years, after it rains, there are even more flowers. By now you’re probably wondering what on earth the title of my post means, or has anything to do with anything. Today the guy I live with got a small box in the mail. It said “Royal Mail” on it, which was pretty cool. There were bulbs inside. I know there are a lot of bulbs in the garden here, but I guess he needed more. Quite a few of these were juno irises, which are irises in the subgenus Scorpiris, a pretty cool name if you ask me. 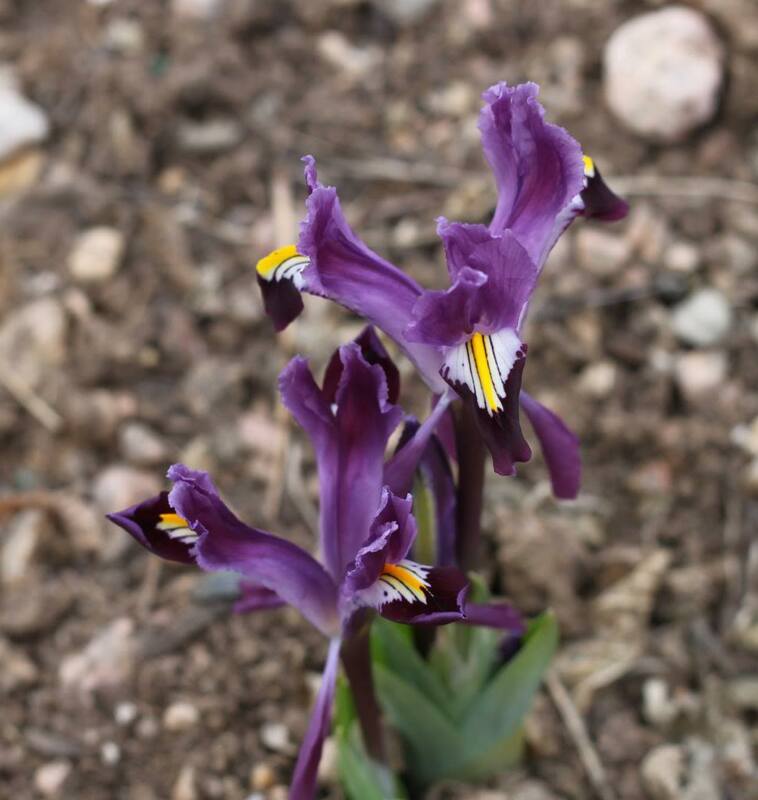 The guy I live with says that there is one easily available in the trade; Iris bucharica. The “bucharica” comes from Bokhara, in Central Asia, and this is where these irises come from. Places in Central Asia. 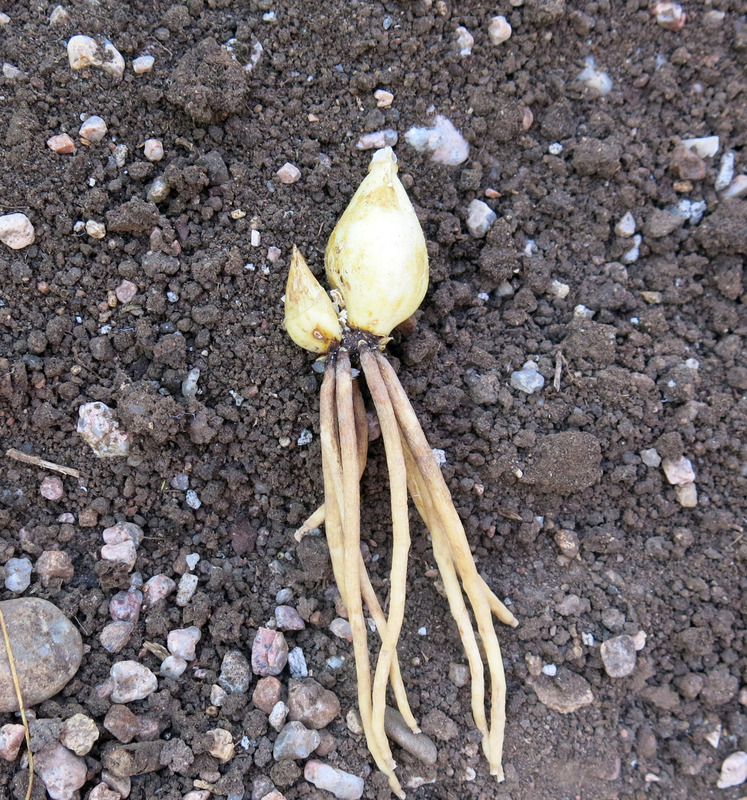 They form bulbs, but with roots. Maybe the botanist who named the subgenus thought they looked like scorpions. I don’t know what a scorpion is (and the guy I live with says I don’t want to know), but they’re kind of creepy-looking. The hole that’s dug for them has to be pretty deep, and the roots have to be treated pretty carefully. I think you can tell what kind of soil these are going in. Really, just dirt. There’s even a special garden just for the juno irises, but of course with other stuff in it. 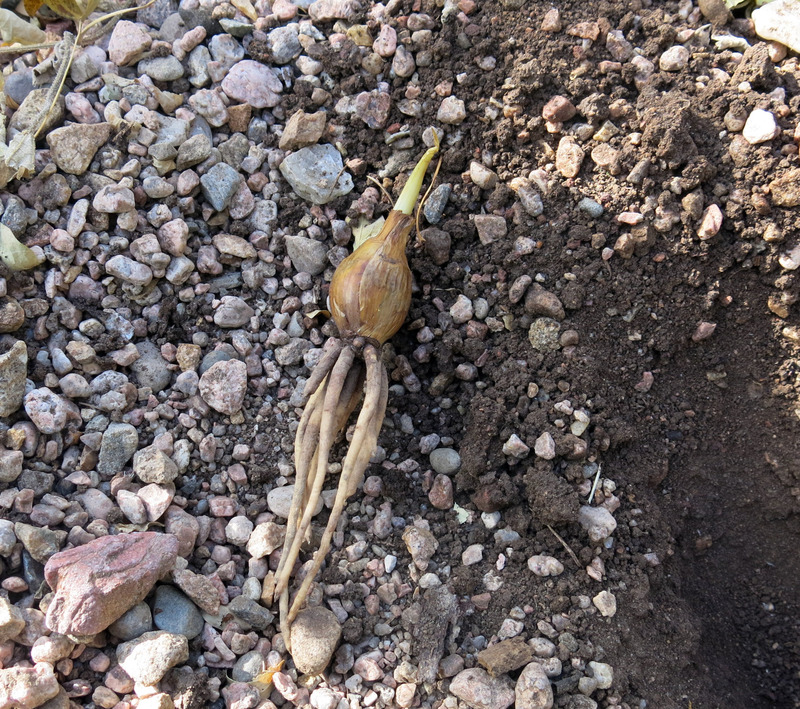 If you’re thinking “Juno irises, big deal”, well, here’s one that already grows in this bed. I think you can see why the guy I live with likes these so much. This little raised bed is covered in snow for a long time in late winter, so that the irises don’t emerge too early. I guess some will come up and try to flower in January, even here, so this situation keeps them underground, and safer, for longer. You can see in that picture that there are some crocuses flowering in the lower right, there. 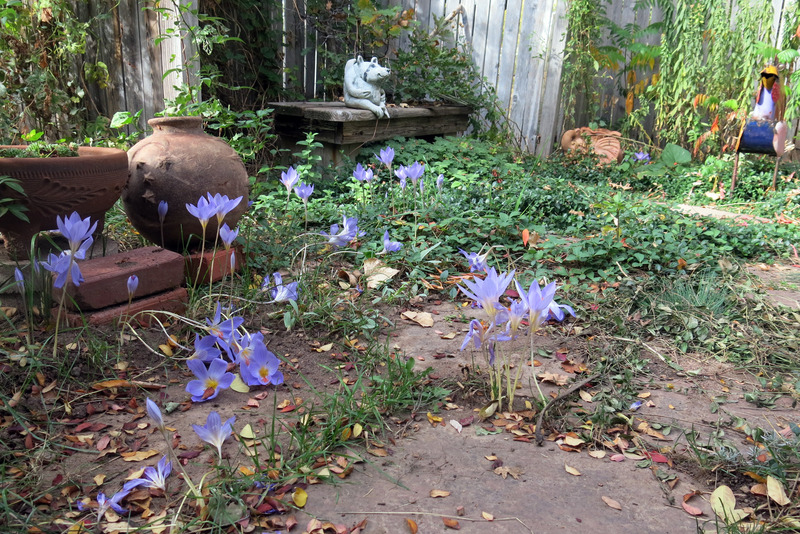 They’re saffron crocuses, Crocus sativus, and the guy I live with kind of smashed them with his foot when he was planting. He was able to collect the saffron threads, though. Well, that was the scorpiris business. 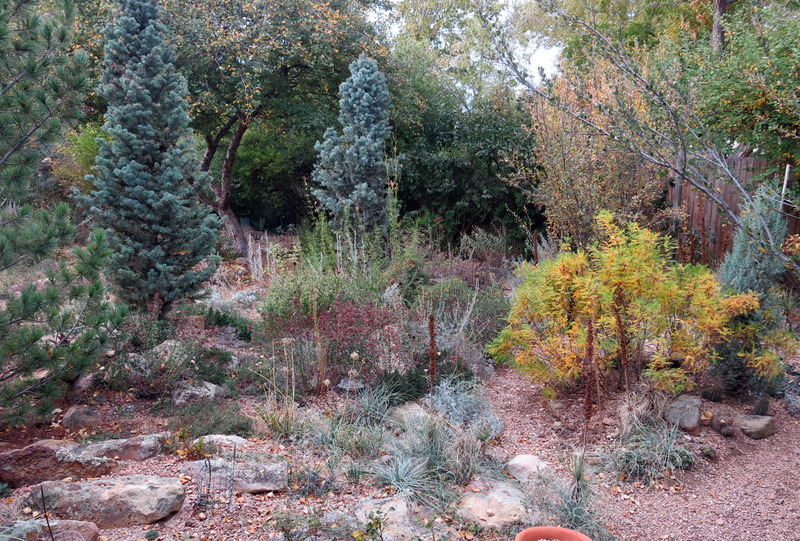 I also wanted to show you what the red was at the back of the main garden, since you saw it earlier. 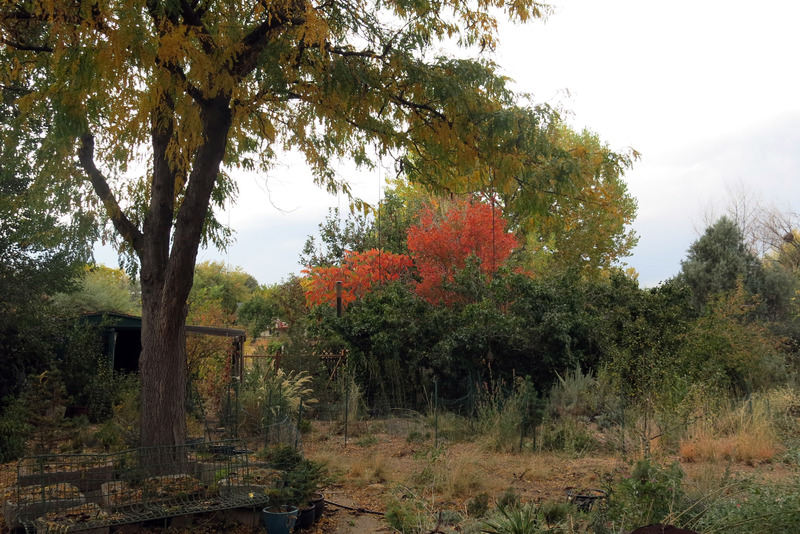 It’s from a sumac, on the left, and the Wasatch maple, Acer grandidentatum, on the right. 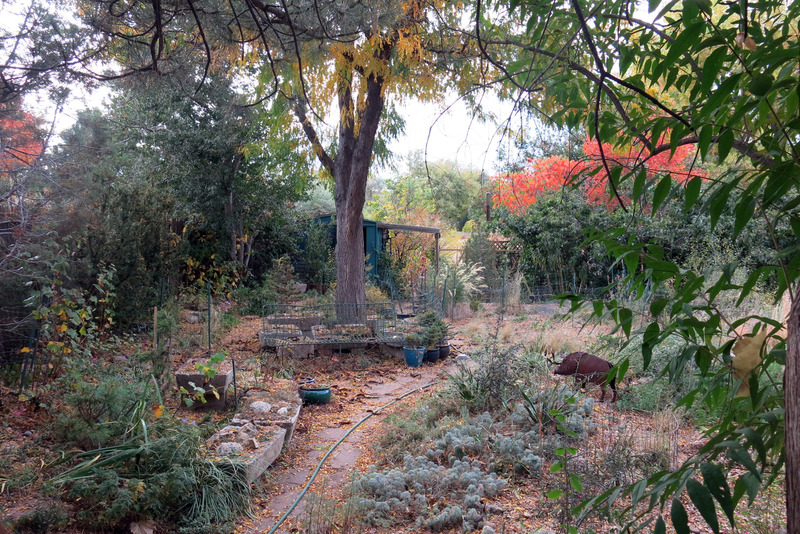 The garden we call the “way back” is behind the lilac hedge there. If it looks like it might rain, well, it did, at least a little. It’s supposed to rain more tomorrow. Or so they say. Well, I guess that’s it. Oh, except for one thing you might find interesting. I did. There’s this program on TV called “the roadshow”, and the guy I live with sometimes watches that, and I’ve discovered that I like to watch it, too. I couldn’t guess how much the vase was worth, and they didn’t say anything about veneer, but I still found it fascinating, as you can see. 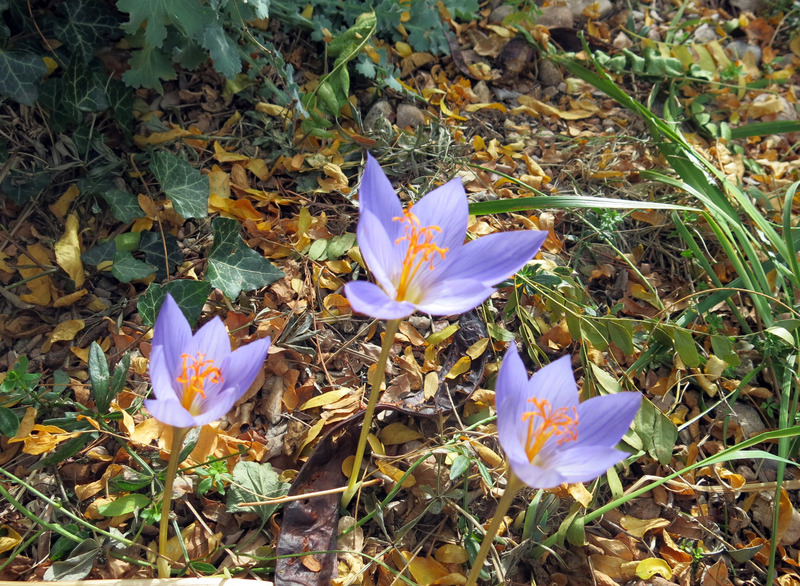 This entry was posted in Uncategorized and tagged Crocus sativus, Crocus speciosus. Bookmark the permalink. Mani, is TGYLW happy this morning? I got rained on all the way to work. Even at my house; no snow!! I love the Iris. Very pretty. Yes, the guy I live with was very happy this morning. I had to wait until I came back from Day Care to respond to this; otherwise you might not think it was me. we can’t have imposters, can we? It’s snowing (wet, sloppy) up the hill this morning. Snow sounds kind of nice. To me, anyway. mani ~ i really enjoyed the walk through your gardens today, and especially liked seeing the iris in flower! also, seeing you enjoy the ROADSHOW, which i do most monday evenings, was adorable. you are such a good companion! Thanks, though I like to think that the guy I live with is the companion. 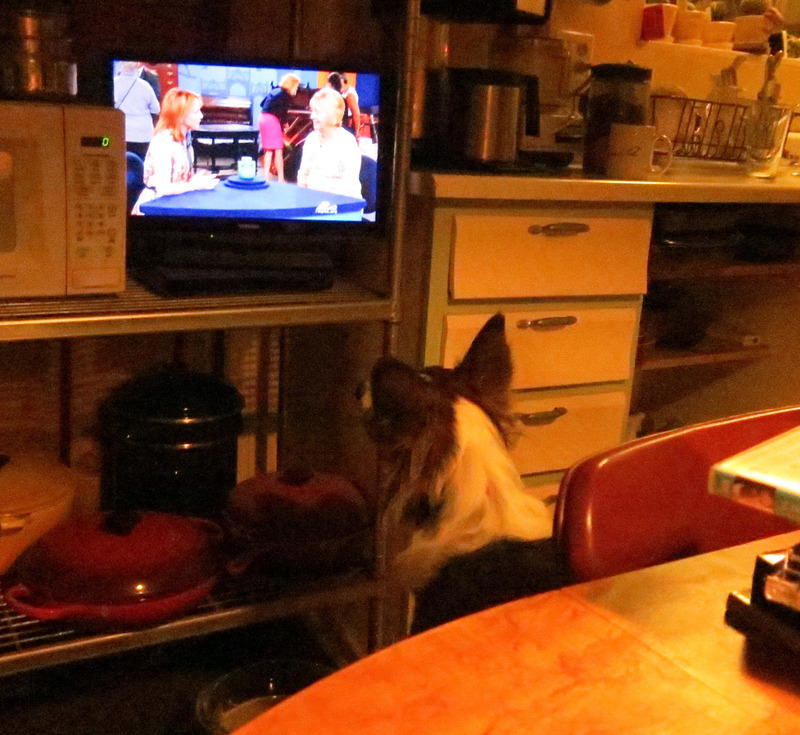 He says we can watch the Roadshow every Monday, if I want. I don’t know what “Monday” is…. You ate your first pod, Mani! and you found it good. Here’s questions: Are there not squirrels for every pod tree? Do pods not drop everywhere? How does Nature handle dropped pods? Why the guy you live with’s near-constant sweeping? I think I shall plant crocus speciosus to give my ants something to do. Oh, those orange trees blaze beautifully against the greenery and the mountains and the sky. Please hurry to tell the guy to put in zauschneria underneath the branches. And the lines in the lovely iris rosenbachiana ‘Tovilj Dara,’ so straight! the colors! Were I a high-end couturier I would design a gown to reflect that iris. All this and Roadshow too, such a charmed life, Mani. The beauty of the iris/the beauty of the dog. Which is superior? They both give much pleasure, equal but different. The back of your head in the last picture conveys so much alertness. Well I joined the local chapter of NARGS in search of more sophistication and possibly happening upon a loftier type of plant at one of the sales. I was able to borrow “High and Dry” from their library and the descriptions of your gardening conditions make us shudder. TGYLW must be very tough and not easily discouraged….I hope you help with that. 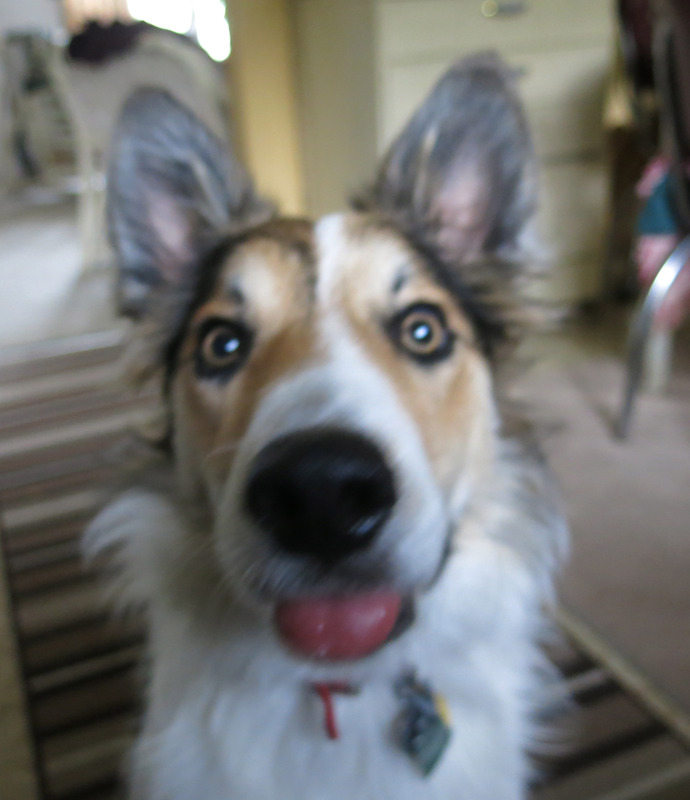 Well, I may be prejudiced, but I think purebred border collies are much more beautiful. You might like the NARGS membership, and especially the plant sales. And meeting other gardeners. We sometimes shudder at the conditions here, but try to grow stuff from climates just like here. I guess you can think that the guy I live with is tough. He would certainly say so. I’m not going to say anything….. Watching the Roadshow is just one more example of how exceptional you are. Not that I needed any convincing. The red leaves on the trees there made me think of a segment on Sunday Morning this past Sunday: they were talking about early 19th century American landscape painters, and they said that when Europeans first saw the paintings of American autumn landscapes, they thought it was a joke or something — because leaves only turn yellow in the fall in Europe; they hadn’t seen orange or red leaves before. I keep thinking about how I take the variety of fall colors for granted and how boring all yellow leaves would be. Thanks; I think I’m pretty exceptional indeed, though I don’t know why I hadn’t seen the Roadshow before now. Sometimes it’s not on, I guess, because there are DVDs playing instead. The guy I live with says the red autumn leaves business has something to do with the Ice Age. Eastern North America and parts of China. China is said to be beautiful in October. The maple, however, is native to the western slope of the Rockies, from Utah south, where it ranges to the east of the Rockies, down into Mexico. It’s thought by some botanists simply to be what they call a “western expression” of the eastern sugar maple, and it was tapped for sugar by settlers in Utah. 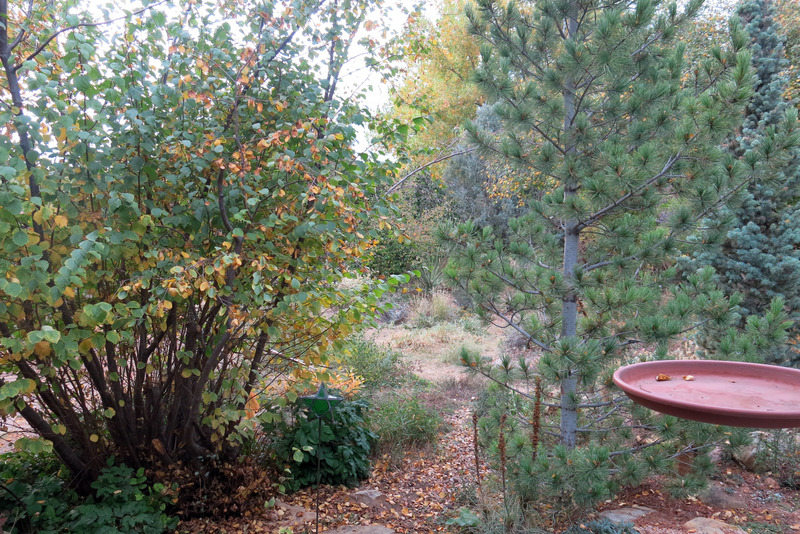 Not really a tree but a huge shrub, though we also have a tree-type form from the Manzano Mountains in New Mexico. I just have that Iris bucharica and really like it. Thanks for expanding my knowledge. The garden is looking fine. Thanks, and you’re welcome. Kind of amazing what two inches of rain will do for the garden. There was a frost warning here last night, but only the field got frosted. It’s lower than our back yard is. I slipped on the frosty grass, but the guy I live with said I wasn’t paying attention to what I was doing.